Agitators with a low circumferential speed (up to 3 m/s) used for homogenisation, heating, cooling, re-dilution, etc. The agitating elements are adapted to the vessel’s shape and the product. The material is chosen in line with the product’s purpose. Agitators with a high circumferential speed (up to 30 m/s) to disperse the filling material, for emulsifying, dissolving, etc. The agitating elements are adapted to the tank’s shape and the product. The material is chosen in line with the product’s purpose. 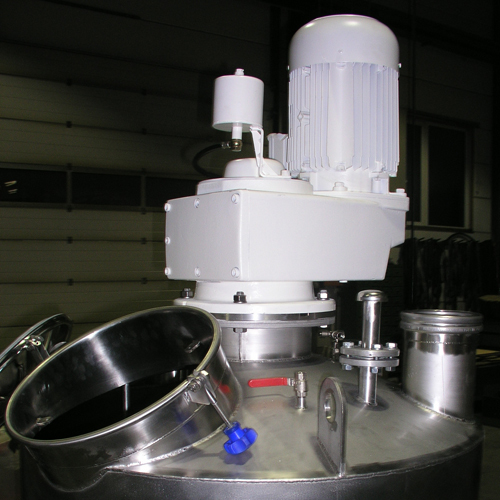 Agitators for mobile tanks and IBC containers. Driven by a gear engine and a frequency converter or with fixed rotational speed.